Upon completion of her Post Graduation in Law from University of Delhi, Ms. Manika Jain joined the Indian Foreign Service in 1993. During her diplomatic career, she has served in Indian Missions and Posts in Portugal, Myanmar, Indonesia and Australia. 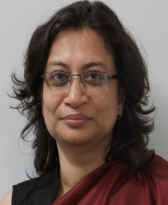 Prior to her appointment as Ambassador to the Kingdom of Cambodia, she held the post of Consul General of India in Melbourne during the period October 2013 to November 2017. At Headquarters, she has been on deputation to the Ministry of Commerce and worked in Trade Policy Division dealing with matters related to W.T.O. In the Ministry of External Affairs, she has worked in East Asia & BSM Divisions. She has also served as Director at Indian Council of World Affairs, and Head of Division at Foreign Service Institute, New Delhi. Before joining Indian Foreign Service, Ms Jain contributed to various social issues such as unorganized labour, women and health.